Last year the top overall UK search was Meghan Markle, now she is only one down?? She must be very popular. Each year Google collects data on the most searched items and stores it on 'Google Trends'. It can tell if there was a spike in searches (e.g. 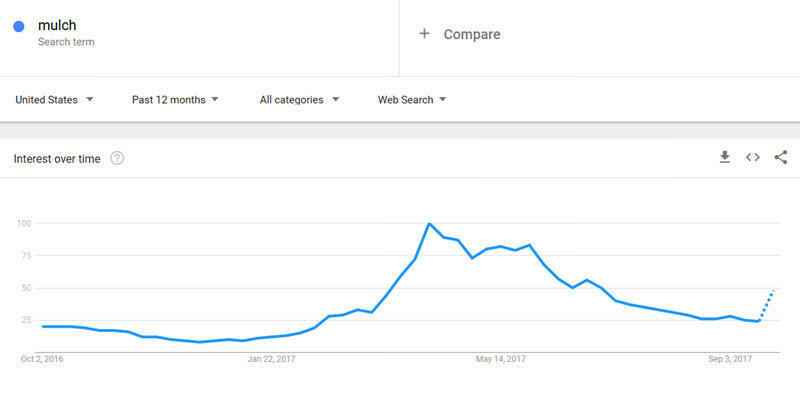 the Football season (World Cup) had a search spike). You can also search for a specific thing by using the search box at the top of the tool. This will let you see how the search volume has varied for that thing over time and in different locations. You can change the location, time frame, category or industry, and type of search (web, news, shopping, YouTube and a few more) for more specific data. Search variation for 'mulch' from October 2016 - September 2017. So here are the UK's TOP 5 Google searches for a bunch of categories! Are you surprised by these trend results?